PUTRAJAYA (THE STAR/ASIA NEWS NETWORK) - Allow space for Malaysian and Singaporean technical experts to settle the Seletar Airport Instrument Landing System (ILS) dispute, Malaysia's Transport Minister Anthony Loke said. He said on Thursday (Dec 13) Malaysia had already made its position on the matter "very clear" and does not intend to prolong it. "Enough has been said (on the ILS issue). We have made our points. We have even come up with a video to explain our position. I think it is very clear," he said. "On any technical considerations, I think I will leave it to the technical experts from both sides to thrash it out," he added. Mr Loke was asked to comment on the issue at a press conference at the Kuala Lumpur International Airport 2. The issue arose when Malaysia revealed that Singapore had issued new ILS procedures for Seletar Airport, which were scheduled to be enforced on Jan 3. 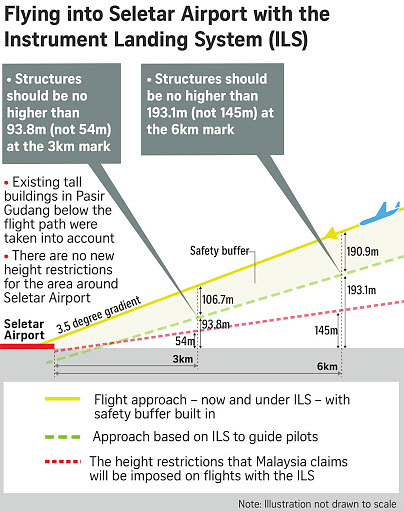 Mr Loke had said using the limitation on the airspace in Pasir Gudang would affect development in the industrial town, as a building height restriction would have to be imposed. Pasir Gudang is located just over 2km away from Seletar Airport.